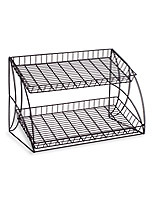 Need retail baskets to use as gift supplies or for upscale retail displays? 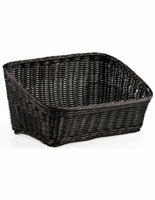 These wicker, plastic and wire containers are designed with style and durability in mind. 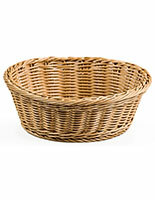 The specialty retail baskets come in many shapes, like rectangular and oval, for the ability to hold many different items. 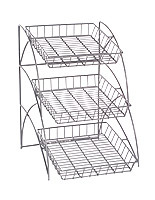 There are even some of the carriers that are sold in sets using the same size bin or in various sizes so they can stack for storage. 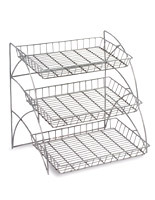 The retail baskets, called market displays, may even be sold with a metal stand to increase the upscale look and versatility of the holders. 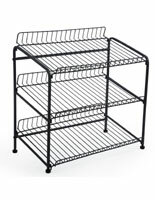 There are so many uses for the willow, propylene, and steel bins that every business can find a use for them, whether it is for sophisticated storage or for merchandising purposes. 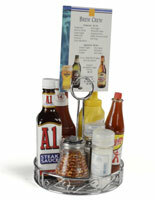 What kinds of items can be placed in the commercial containers? 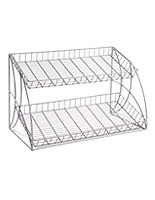 These retail baskets can hold many selections, but they many vary depending on the type of the container. 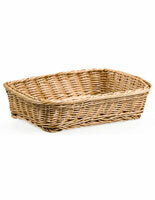 If the display is real wicker it is best to be used with items that will not require that the bin be washed. Willow does not hold up well when water seeps into the wood. Wine bottles would be a good choice as well as closed toiletries. 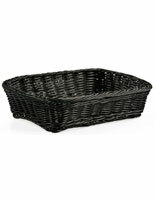 The retail handbaskets that are made of plastic wicker with wire reinforcing offer the look of a willow bin with the ability to fight mold and be placed in the dishwasher. 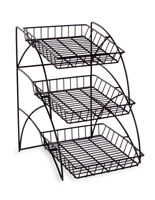 These carriers are ideal for displaying food, fruit, packaged flower arrangements. 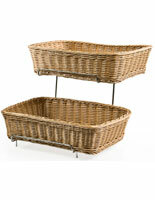 The baskets are perfect for grocery stores that want a more elegance. 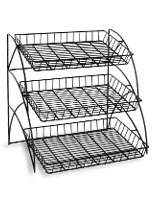 The wire containers offer the most sophistication because of their scrolling. 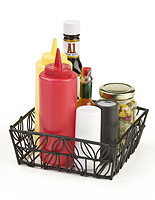 Again, these stands are not dishwasher safe and so not great for displaying food, but are ideal for the placement of closed condiments. 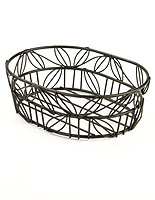 They also make great gift packaging for candles or bath supplies because the metal won’t absorb the scent. 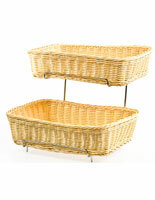 These retail handbaskets can be used in any business that wants eye-pleasing storage or upscale gift supplies. These containers are perfect for markets that sell flower arrangements or fruit displays covered in cellophane during the holidays. Gourmet restaurants that sell their own in-house pasta or sauce can use the plastic wicker baskets as gift packaging for housewarmings or as a place to store individual oregano or pepper flake shakers so each table gets their own spices. Hotels that serve continental breakfasts or host buffets can use the bins to serve bread on every table or those baskets with metal stands to offer plenty of cereal, bagels or other food for the choosing. 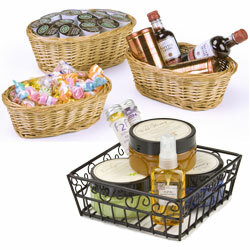 Inns can use the handbasket sets to maintain a consistent look in each bathroom by offering toiletries in the same bin. 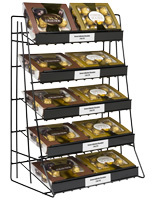 Specialty stores, like wine shops, could use the carriers to offer samples throughout a space, hors d’oeuvres, or as a more interesting display. 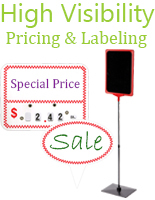 Use them for whatever purpose your business deems fit, but make sure the take advantage of our bulk quantities and low pricing!